The way we currently manage energy is unsustainable. Three megatrends are provoking an important increase in energy demand: Urbanization, industrialization, and digitization. Today we still depend on unsustainable CO2-emitting fuels for 85% of our energy, trapping an ever increasing amount of heat in the atmosphere. Yet at the same time, we believe that access to energy is a basic human right—but 1.3 billion people have no electricity at all and another billion have only an intermittent supply. If we are to move towards a more sustainable future we must become radically more efficient with the way we use energy. There are four transformational developments that will enable us to take this opportunity head on: the Internet of Things (IoT), the convergence of Operational Technology (OT) and Information Technology (IT), the decentralization of the grid powered by renewables, and the generalization of Smart Grid to manage variable demand and renewable intermmitency and decentralization. Connected ‘smart’ technology can automatically measure, monitor and control energy consumption and demands. When we couple automation and energy with software and analytics you get an unprecedented level of operational intelligence to make better, more predictive decisions in real time. This is the innovative foundational solution for the 4 key markets that consume 70% of the world’s energy – Industry, Infrastructure, Buildings & Residential, Data Centers & Networks. 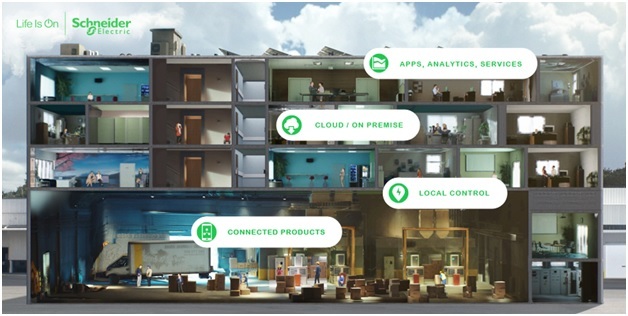 At Schneider Electric, we innovate at every level to benefit customers across industries, grid utilities, data centers, buildings and homes. Innovation at every level is future-proof and redefines energy management and automation for customer outcomes and at the same time addresses the energy dilemma for a more sustainable planet, ensuring Life is On for everyone, everywhere at every moment. Gracias, por permitirme incorporarme con ustedes, con gusto estaré pendiente de su información, en lo personal me interesa mucho la actualización. En la actualidad estoy en el Ceti, Guadalajara, Jalisco, como docente en la carrera de Ingeniería Mecatrónica. Nuevamente gracias.